Houston, as possibly definitely the best food city in America, has no shortage of delish veggie burgers out there for you to try. As a vegetarian going on nine years, I’ve basically been vetting them for forever and these are my favorites that were the most memorable. They’re all unique and made of everything from mushrooms to beets to nuts–even the pickiest meat eater would find something to love here. Local Foods, 2555 Kirby Dr. In general, the dishes at Local Foods are just oozing with positive energy and locally sourced ingredients, but the Garden Sammie is possibly one of the most delightful combinations of vegetables and bread around. It’s packed with Brussels sprouts, avocado, hummus and served with picked onions on ciabatta. Pro tip: Top the sandwich with the house made hot sauce. The Sammie is served with two sides of choice. I’m a big fan of the kale salad and soba noodles. Despite being vegetarian, the meal tends to be pretty filling and I like to take one half of the sandwich home. Tiny Boxwoods, 3614 West Alabama St. 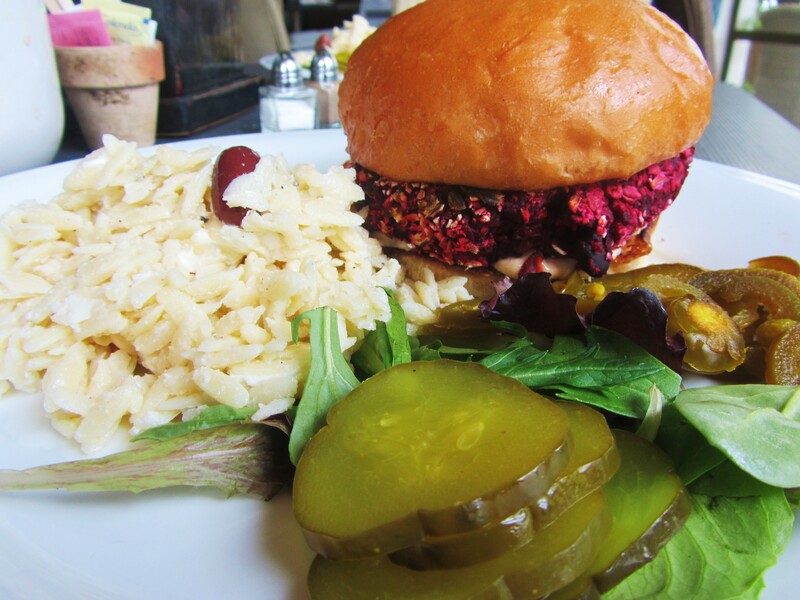 Skip brunch food and straight to lunch with the Just Beet It Burger at Tiny Boxwoods. Delicious and a crazy, vibrant color of pink this isn’t your typical black bean burger and it’s certainly not the kind you find in the frozen food section (*shiver*). The homemade patty is half beet, half black bean. Topped with chipotle aioli and jalopenos, the beet burger has that perfect level of spice. Recommend heading to Tiny Boxwoods for Sunday brunch (the food is worth the insane lines that tend to snake out the door) and pair the burger with a side of the pasta salad and one of the house cocktails. Think sangria, white wine mojito or mimosa because #brunch. Feeling sassy? Head to Beaver’s (it’s just south of Hooters*) for their Beaver Nut Burger. It’s part rice part cashew part walnut. Never have I ever seen a burger made of nuts before Beaver’s. And props to them for pulling it off. Topped with their sweet housemade pickles and miso-mustard sauce (could eat it with a spoon), the burger is quite delish. However, I must add the homemade oregano chips give the burger a run for its money. They are unique and seasoned to perfection. Go for the fries if you love salt. Recommend pairing the burger with one of the many craft cocktails that Beaver offers. They have a pretty generous happy hour every day of the week. Pat Greer’s Kitchen, 412 W. Clay St.
Channeling your inner-hippie? Visit Pat Greer’s Kitchen. Literally you walk into a small townhouse in Montrose and into her kitchen. Pat works the counter and you can see her team prepping the food just a few feet away. Her food is raw, vegan, and local. The menu changes seasonally, but garden burgers are always on the menu in some way, shape or form. I tried the Bar-B-Cue Burger wrapped in lettuce leaves and served with a side of tangy barbecue sauce and sweet raisin slaw. First time you go you also get to take home a sample of one of their homemade raw, vegan desserts (think Pecan Pie, Coconut Dream, Chocolate Fudge, and more!) and the chance to sample all sorts of crazy health-snacks like spinach chips and quinoa crackers. Just reading the menu makes you feel more healthy. Note-to-self: Pat Greer’s Kitchen is just that, it’s a kitchen, no seating. So plan ahead and know it’s only to-go. Recommended if you feel the need to cleanse away the previous weekend’s week’s sins. 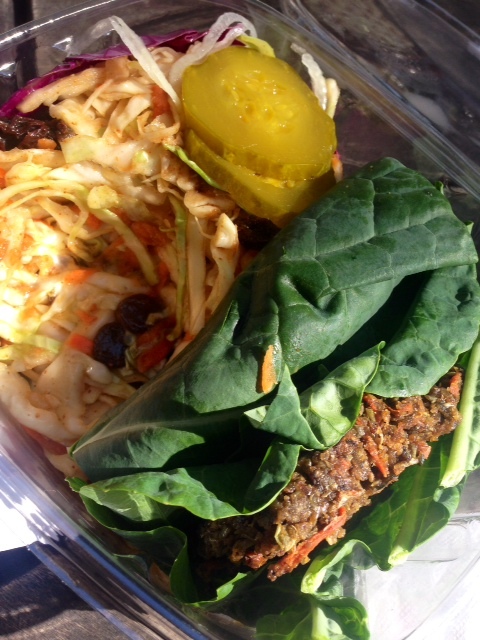 Grab a homemade veggie burger on the go at the Ripe Cuisine food truck. 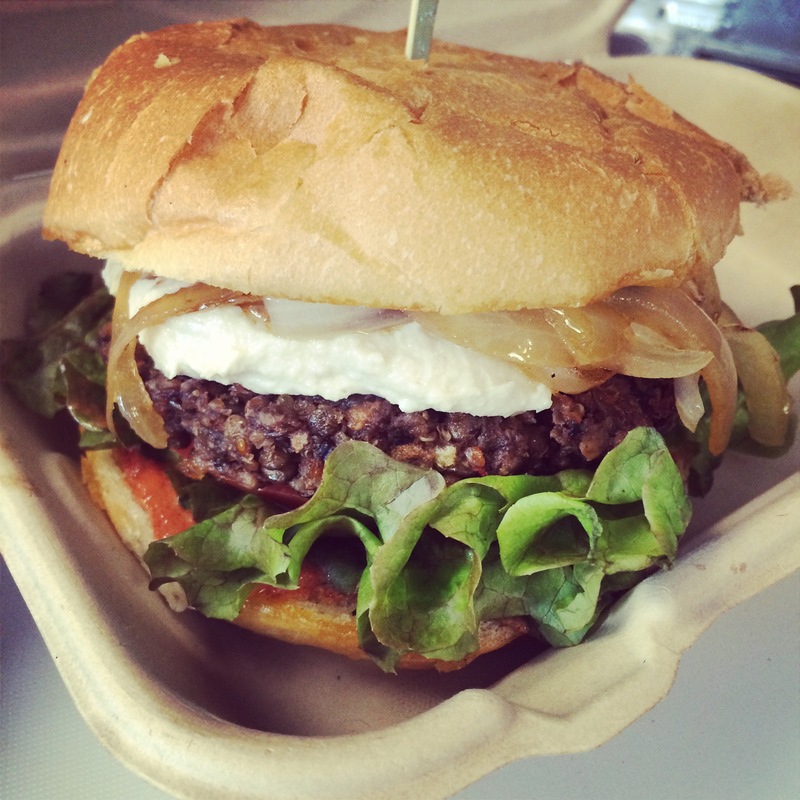 The Bistro Burger is an organic lentil-mushroom patty topped with red pepper aioli and balsamic caramelized onions. Everything that Ripe Cuisine serves is locally-sourced, vegetarian, and hella healthy. Pair with sweet potato fries and you’re good to go. However, since Ripe Cuisine is a food truck, they may be hard to track down, but I like to catch them outside at the Downtown Houston Library on Wednesdays (they’ll be back at this location in February). Recommended for a quick lunch on the go. It is a food truck after all. 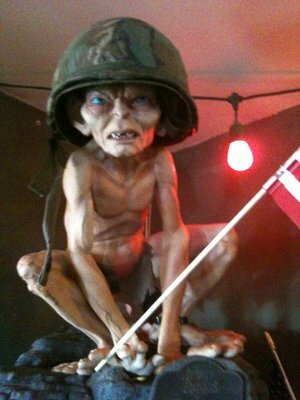 Honorable Mention: Hobbit Café, 2243 Richmond Ave. The Soy Burger at Hobbit Cafe is an interesting take on a traditional burger served at a less than traditional venue. You’re surrounded by Lord of the Rings paraphernalia, shaded by a giant oak tree and encouraged to try some “Hobbit-quality” beers and wines. The “hobbit-made” burger itself is best topped with sprouts and avocado. Pair with the veggie soup of the day and take in the Shire-esque surroundings. Recommended for vegetarians, nerds and Frodo. Bonus: Baba Yega, 2607 Grant St. Think outside the buns and try a Vegetarian Reuben at Baba Yega’s in Montrose. Yes, I know it’s not technically a veggie burger (and Baba Yega’s actually makes a homemade black bean burger) but the Reuben is a unique vegetarian option that isn’t offered all that much, if ever. It has all the fixins of a typical rueben–heaps of sauerkraut, marbled rye, melted swiss but instead of roast beef Baba Yega’s serves up what they call a “homemade wheat roast”. Recommend trying the potato salad. It’s less of a salad and more of a scoop of mashed potatoes with celery and generous helpings of dill. It’s unique and you probably won’t find anything like it anywhere else. 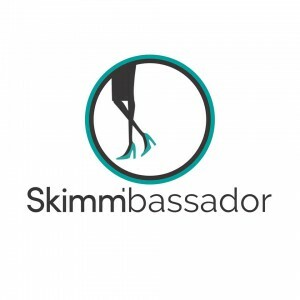 Interested in other vegetarian adventures in Houston? Check out other It’s Not Hou vegetarian restaurant reviews and It’s Fare foodie experiences! 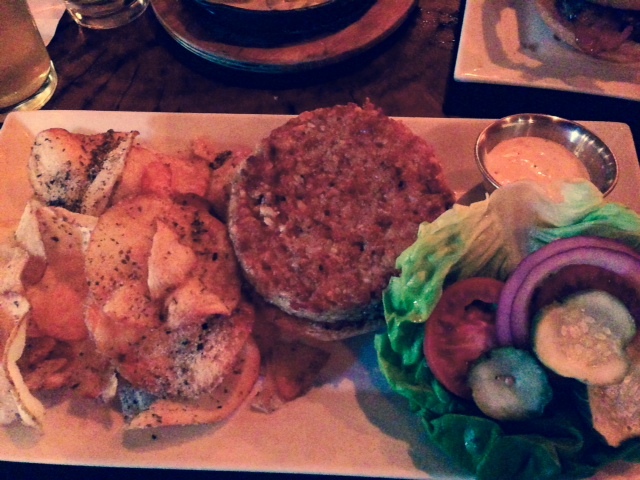 Also check out my latest review on The Counter…which may or may not have the best veggie burger in Houston! Tags: Baba Yega, houston, Houston Eats, Local Foods, Pat Greer, vegan, vegetarian, veggie burger. Bookmark the permalink.